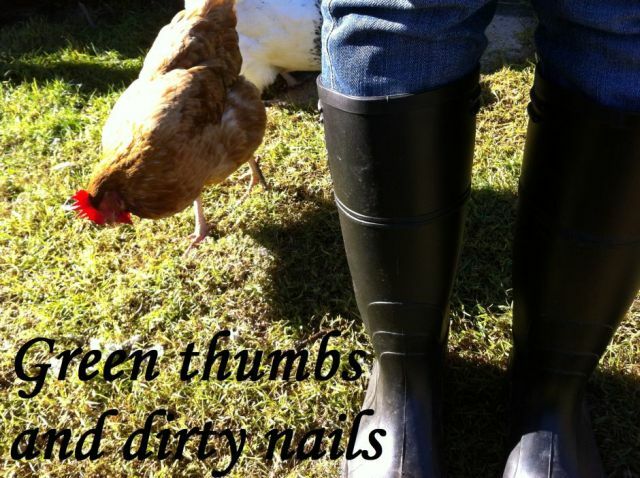 Green thumbs and dirty nails...: The girls. I arrived home Friday afternoon to find that my chicken coop had been delivered and Jamie had spent three hours putting it together (thanks honey!). It is fantastic. The perfect size for the space I had picked out for it in the yard. There is plenty of room inside the coop to provide shelter and comfort for the girls during the night, and with the addition of the chicken run I added to the end, there is plenty of roaming room for all. I piled up my car with large cardboard boxes and drove over an hour yesterday to a very small country town where a man named Garry was selling chicken. I had found Garry on the internet, and after a few text messages back and forth (while I googled the breads of chickens he had, just so I knew they looked nice) we had struck up a deal. I brought them home and introduced them to their new quarters as the rain poured down. They didn't seem to be bothered by the miserable weather, and quickly made themselves at home; scratching at the mulch and feeding on seed and lettuce leaves. Success! It must have been the strawberries that made them feel relaxed.